Depending upon where in the world you were racing it was either hot or cold out. 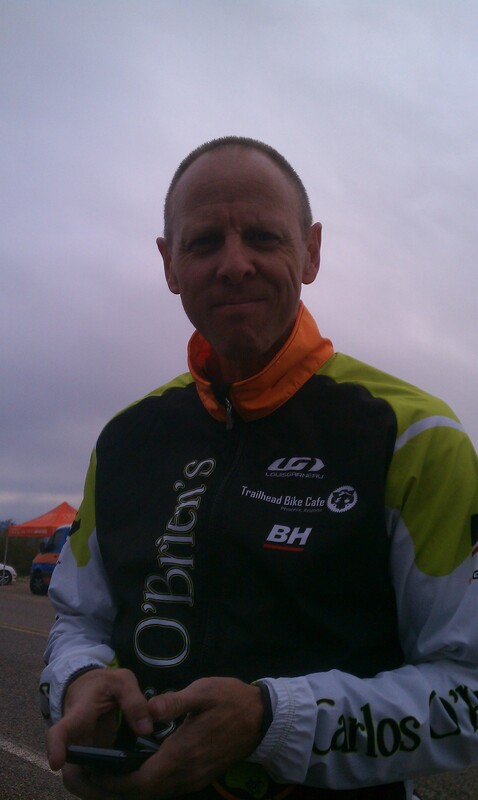 John took the cold route and went out to the Flapjacks TT outside of Tucson, AZ. When you think Tucson in January, images of sunny, warm weather usually come to mind right? Well in this case you’re wrong. Instead conjure up images of a heavy cloud cover, no sun and air thick enough you could cut it with a knife. That gave way to dropping temps and a slight cold breeze as the morning wore on. Cold temps or not, John grabbed third in the men’s Cat 5 30k TT. WTF? It’s AZ and it’s cold! Kicking off the weekend on the other side of the equator and a day ahead Janine raced in 35+C temps at the Mandurah Triathlon which doubled as the Western Australia State Championships. She finished 8th overall for the women, as the 3rd overall age group athlete and won her age group making her the W35-39 State Champ. She came off the bike in a dead heat for the lead in her age group. It then became a foot race to see who would stand atop the podium for their age group. Janine used her foot speed to open up almost a 2 minute gap to win her age group. All this came a week after getting stung by a bee while riding, crashing into a chain link fence then tumbling bike over body onto the ground.